November 20, 2018 – This past May, seasoned adventurer/filmmaker Jon Griffith and team packed their bags, donned their thermal gear and set course towards a destination only the boldest ever reach – Mount Everest. Griffith’s company Alpine Exposures was tasked with creating an 8K 3D video that would completely immerse viewers in both the sights and sounds of this legendary locale. To help, they brought along the all-new ZOOM H3-VR Handy Recorder. The creation of spatial sound for VR requires an Ambisonics rig that can capture, record, decode and encode 360-audio. To do so in such harsh conditions demands that the rig be both portable and durable. Griffith explained that while previous rigs provided great sound quality, they were too “bulky and heavy” for this type of expedition. While the average creator likely won’t find himself filming on the side of Mt. 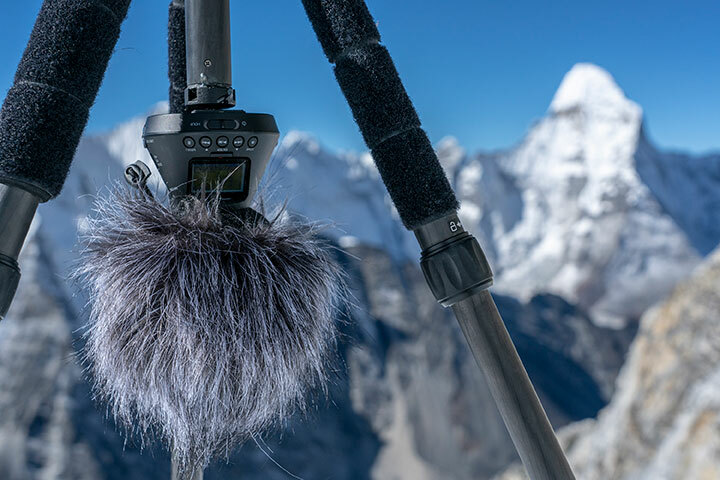 Everest, the H3-VR’s success there provides confidence to anyone considering it for their VR and 360-degree productions. As Jon Griffith put it, “If it can stand up to the rigors of the Himalayan elements, it’s not going to let you down wherever you want to shoot your next VR experience”. For more information on the ZOOM H3-VR, including specs and videos, please visit www.zoom.co.jp/H3-VR.